Point-and-figure is a method to represent the price information on charts. It is like Japanese candlesticks, bars and lines but different. It does not use the time scale at all. While the vertical scale is still designated for price, the horizontal scale measures only the number of price reversals or movements and says nothing about the time when they have started or ended. At first, such charts may seems strange and alien to a currency trader, but point-and-figure charts are the perfect noise filters and display only information that is really valuable — the prices big enough to bother about. And a trader has a full control of what price changes he wants to be informed of. Point-and-figure charts are often call P&F or PnF or simply XO. The name XO goes from the classic way such charts are drawn — the bullish movement is represented by the column of X’s, while the bearish movement is shown with a column of O’s. Of course, nowadays, almost any symbol or just a colored box can be used to chart point-and-figure movements. To start drawing a P&F chart, first, it is necessary to decide the box size — the price change that would be big enough to draw as either X or O on the chart. 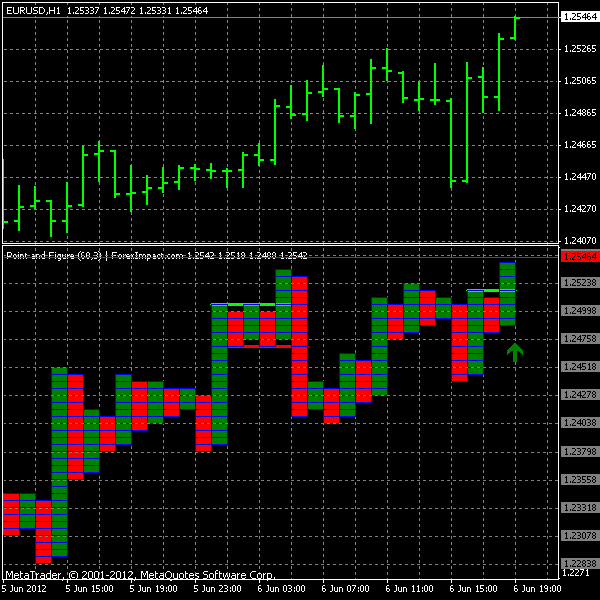 Usually, the box size is chosen as 10 pips in Forex trading. Of course, any box size can be used — 6, 50, 100 or even 1,000 pips. The bigger is the box size more filtered the P&F chart will be and less movements it will contain. The smaller is the box less filtered becomes the price and more price movements get pictured on the chart. Once the size of the box is chosen, the starting point is decided can the drawing can be started. 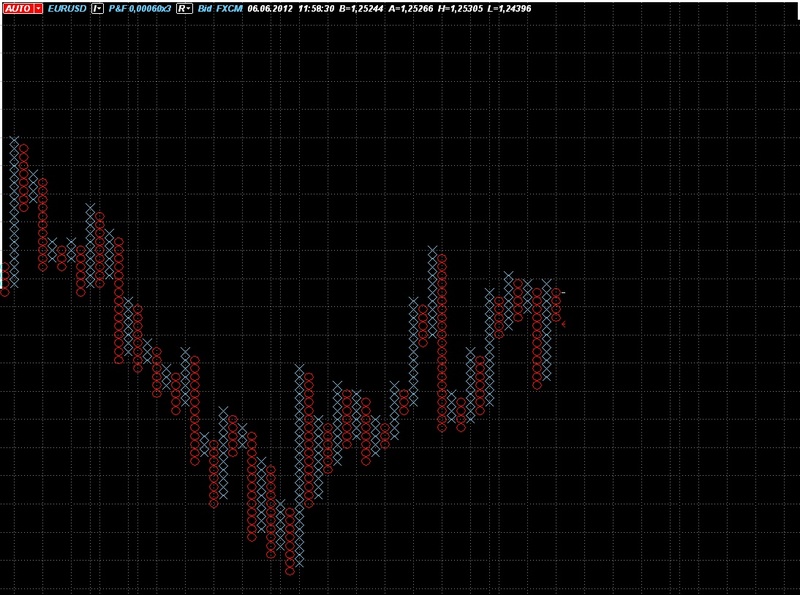 When the price goes up 10 pips up (let us consider the box size = 10) an X can be drawn on the chart. When the price goes up another 10 pips, a new X is drawn on top of the first one and so on. 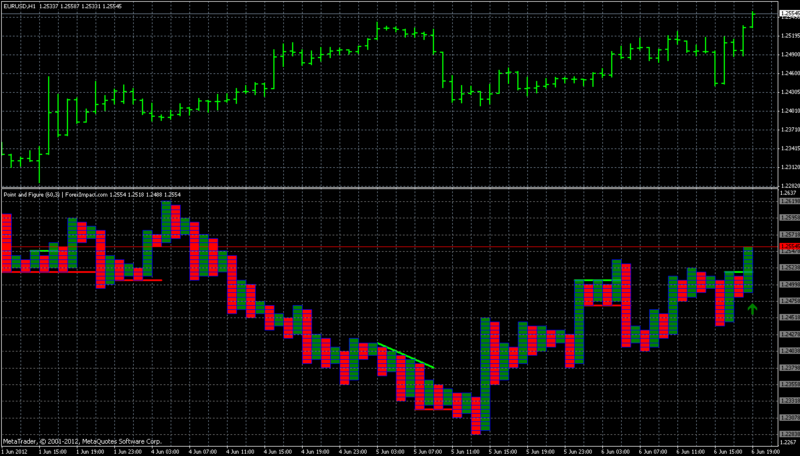 If the price fluctuates within 10 pips, nothing is drawn on the chart. As you see, the filtering power of the method is obvious. 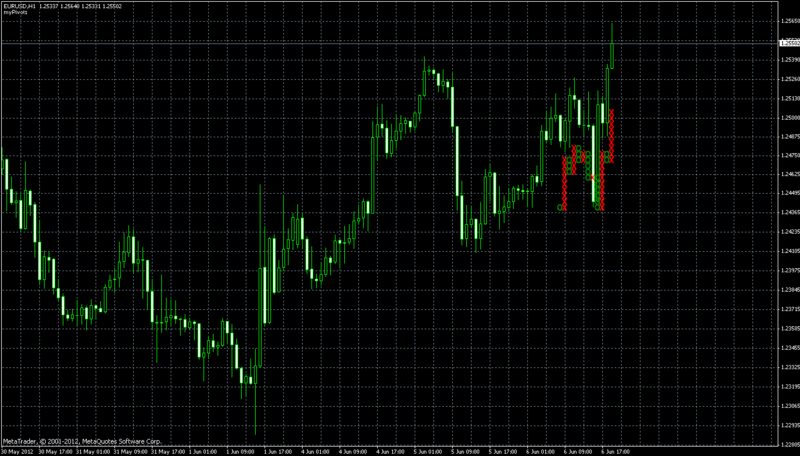 To draw a bearish movement, it would be necessary to put an O for every 10 pips that the price goes down. In addition to the box size, another important parameter is chosen by a trader — reversal size. The reversal size is the number of boxes that the price has to go against the current movement to end it and to start drawing a new one in the opposite direction. The reversal size of 3 and 4 is quite common but any integer number equal or greater than 1 can be chosen as the reversal size. Let us consider the reversal size = 3. If the bullish movement (a column of ascending X’s) is currently being drawn, then to qualify for a reversal, the price has to go down by 3 × 10 = 30 pips. And if it does, the first O is drawn in the next column, one box below the top X of the previous column (the price went down); additionally, two more O’s are drown in the same column below the first O as it was the movement of 30 pips, which for a box size of 10 pips means 3 boxes. The process continues ad infinitum. As a result, a trader sees a lot of X’s and O’s plotted on the chart — they represent the price changes in pure form and can still be analysed with the conventional technical analysis tools, for example — chart patterns. You can scroll down to see several examples of the P&F charts plotted in different FX trading software. Only 4% of this blog’s readers prefer using point-and-figure charts to trade Forex. One of the probable reasons for this can be the fact that P&F charts are not supported by many trading platforms. For example, neither MetaTrader 4 nor MetaTrader 5 provide point-and-figure view as a part of their default toolsets. 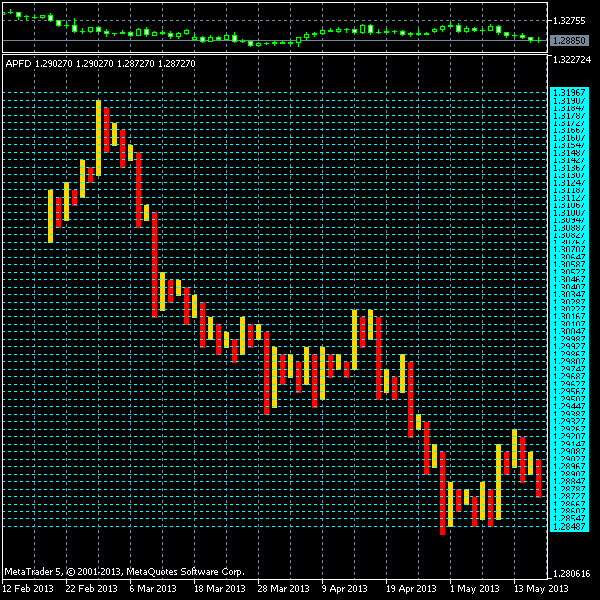 Fortunately, there are numerous charting solutions to draw Forex point-and-figure charts. It is also a very good thing that you are not obliged to trade using the same platform which you use for charting, so your choice should not be limited by your broker. Here, I will present several ways to get P&F charts for your analysis. 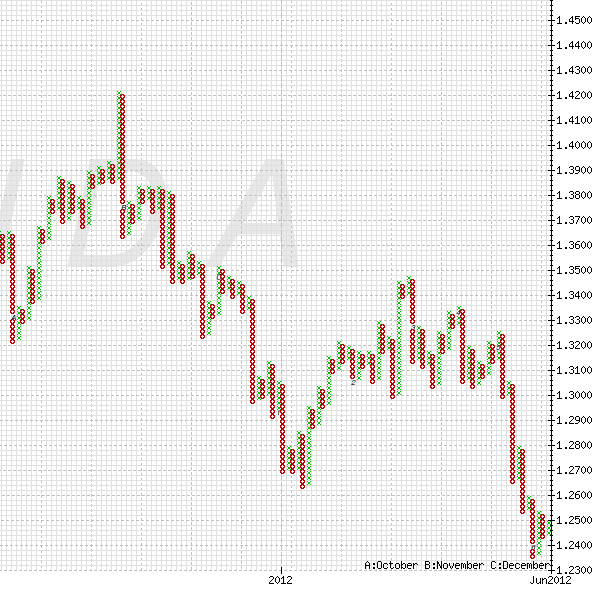 All charts (except Oanda’s) display EUR/USD with box size set to 6 standard pips and reversal set to 3. DealBook 360 from GFT Forex offers rather simple way to show P&F charts. 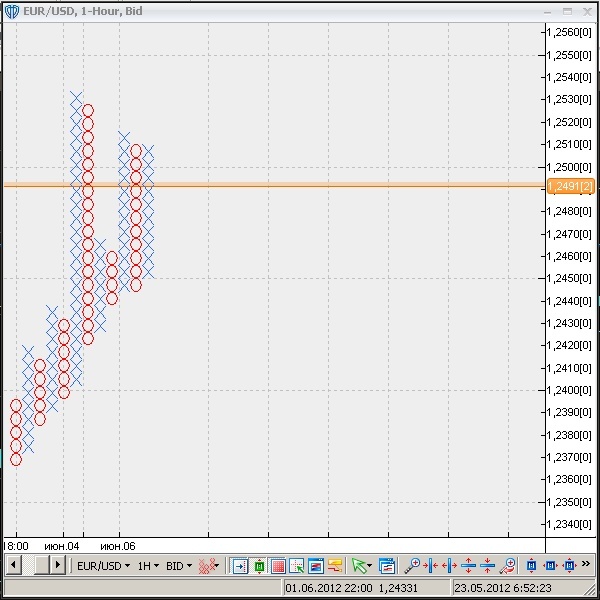 No time data is displayed on the chart but the box/reversal size customization is available. The program can also calculate the optimal box size depending on the symbol trading range. The interface is a bit confusing but nothing too complex. FX AccuCharts presented by FX Solutions is not much different from DealBook 360 in terms of P&F charting: the same customization options are usable, no info about time on the chart and almost the same degree of ugliness of the plotted graphics. At the same time, the interface for P&F seemed a bit friendlier here. 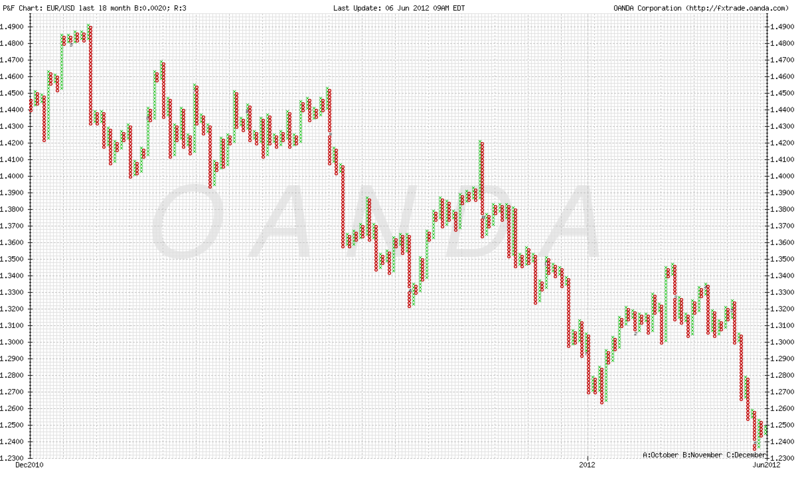 Web-based P&F chart by Oanda is probably the worst point-and-figure solution you can expect from such a popular broker, but it does not require any software other than your browser. 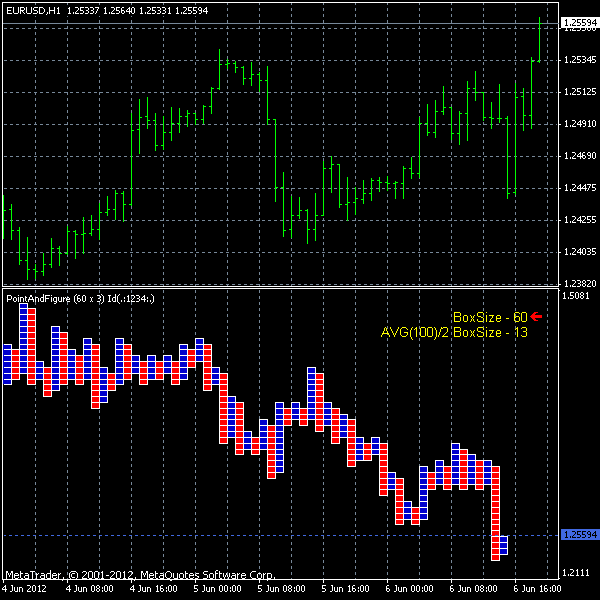 The box size can be chosen from 20, 30 or 40 pips, while the reversal size is not customizable at all. Though the trendlines can be drawn automatically here. Strategy Trader by FXCM provides a simpler interface than the first two listed solutions but does not offer an option to scale the box size automatically. Other than that, it is a fast way to get a point-and-figure chart with desired parameters. VT Trader developed by Visual Trading Systems and provided by CMSFX has a rather strange interface but offers at least some date/time indications for their P&F charts. The chart settings are customizable but there is no ‘auto’ size calculation for the point-and-figure box. Unfortunately, only MT4 solutions are currently available here. This will probably change soon as the popularity of MQL5 grows alongside the expansion of the fifth version of MetaTrader to major brokers and new traders. 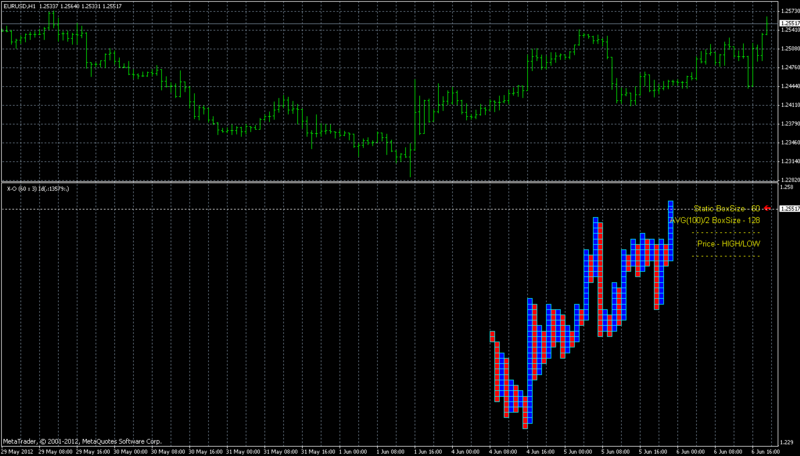 Here is an overview of several free P&F charting indicators for MetaTrader 4. Cute Point & Figure Indicator v.1.1 — a free version of the paid indicator with the same name. 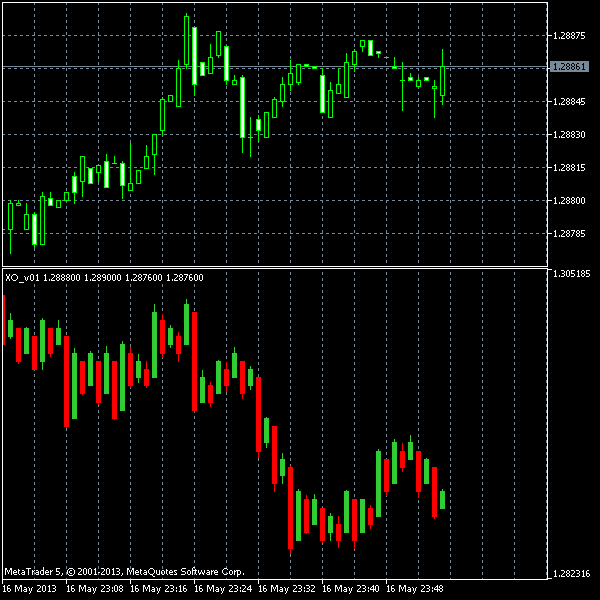 Comes with four different MetaTrader templates and can be quite tricky to set up. Once set up, offers a rather nice layout of X’s and O’s or boxes directly in the main chart window, with dates, months and years marked directly on the chart — very handy. The chart settings can be adjusted to the smallest details. The main drawback — calculation is very slow and can freeze a trading terminal. Oh, and the source code is not available for tweaking. FXI Point and Figure by Forex Impact — not only it is a fully customizable and very fast P&F indicator, it also shows the trendlines for the price movements and gives signals according to the common point-and-figure chart patterns. Additionally, its code is open-source and can be used to build even more sophisticated XO indicators. 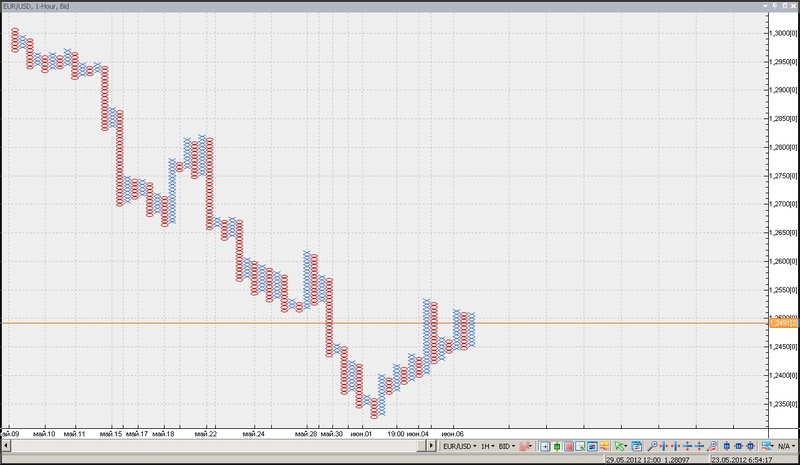 Point and Figure mod 2 offers a rather clear P&F picture for your MetaTrader charts. 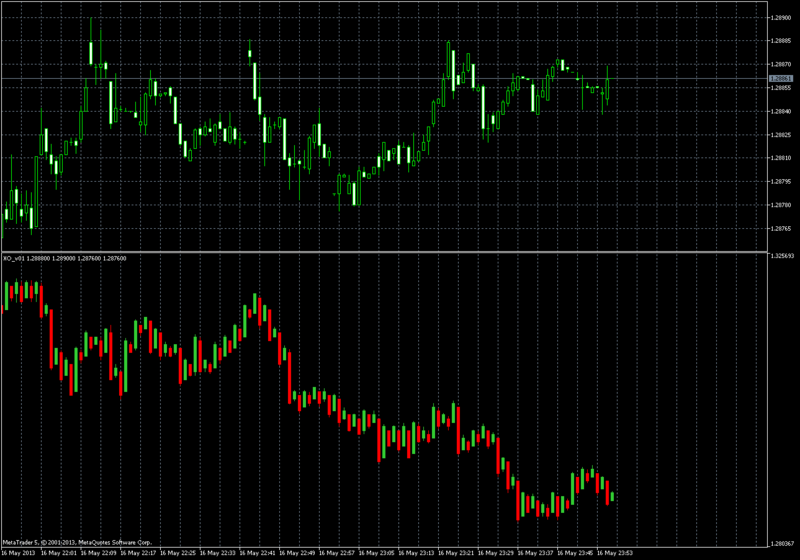 Box size can be set either manually or calculated by the indicator automatically using the average trading range. A trader can tune the look of the P&F chart and limit the amount of original candles it uses for calculation. This can help if the indicator becomes too slow. my Point and Figure — my own test point-and-figure indicator in a very unstable and experimental state. It shows XO’s based on real-time tick data and it will take some time (several hours probably) for it to draw something eligible. It does not use the existing chart data as it is not accurate enough to draw exact P&F. 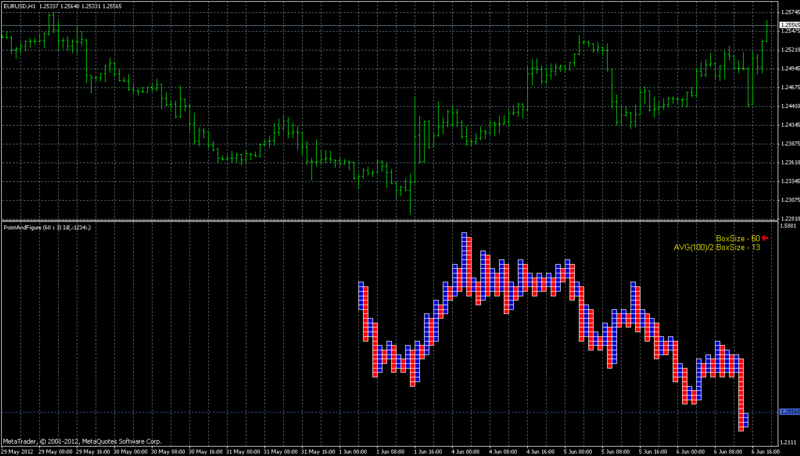 Thus this indicator will be completely restarted if it is re-attached to the chart or MetaTrader is re-launched. 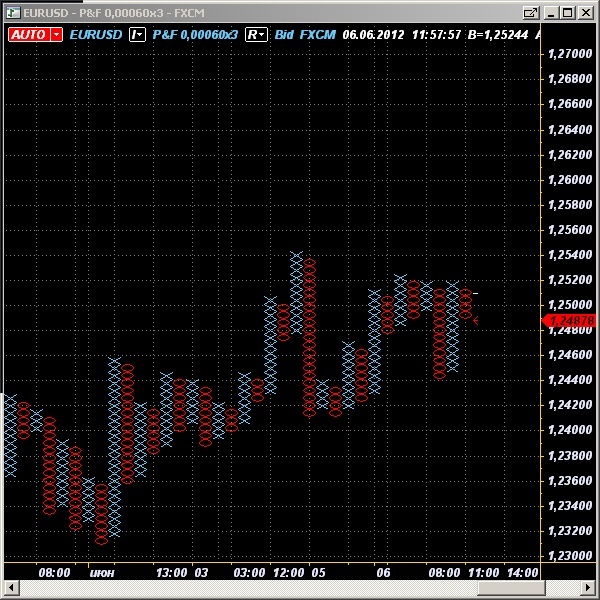 It is displayed in the main chart window and works extremely fast compared to the conventional P&F indicators. I include it here only for the sake of completeness. 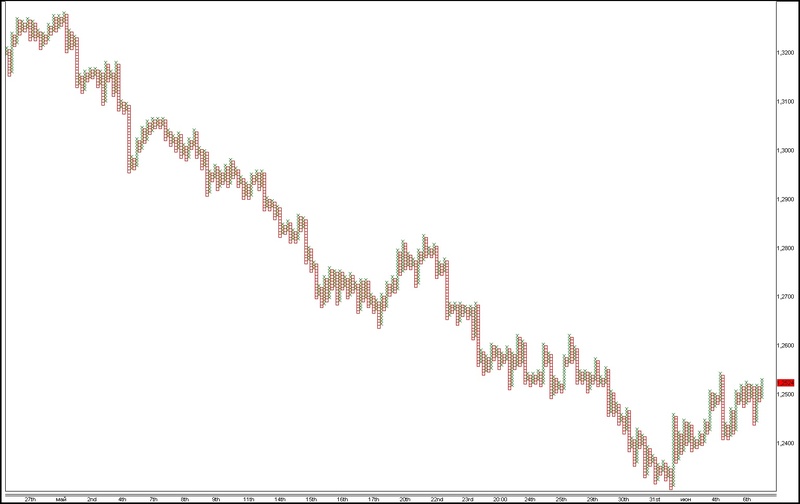 Of course, it can also be used to create your own P&F indicator for MT4 as its source code is fully open. 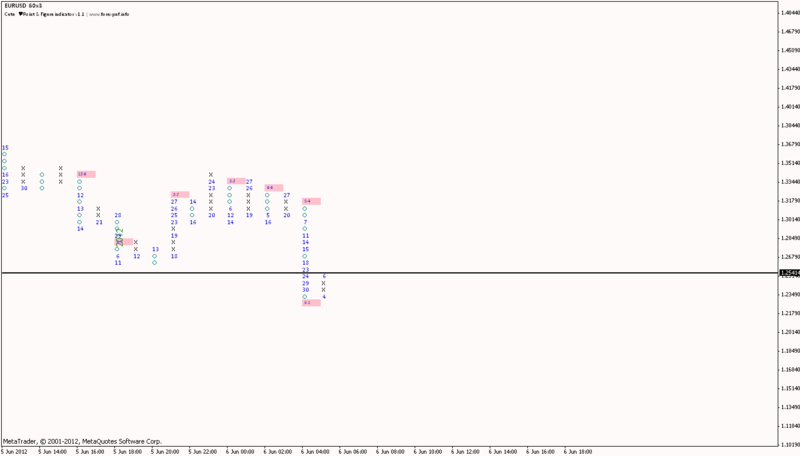 nb Point and Figure — an awesome and fully configurable P&F chart indicator. 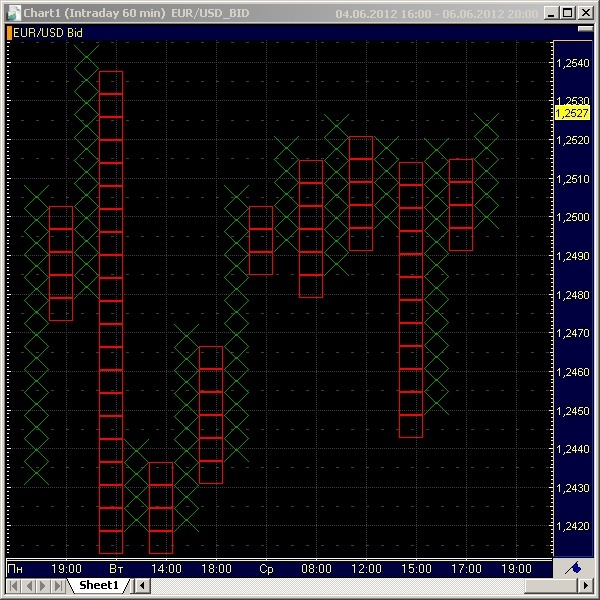 Not only it can display time information near the XO columns, it also displays projections of the P&F chart onto the main chart, showing which candles relate to which price movement. It works pretty fast and the number of bars it processes can be changed. The disadvantage is that its source code is not available. X-dOrsey — quite similar to the previously described Point and Figure mod 02 indicator. Not the fastest P&F solution out there but, fortunately, the number of bars for processing is adjustable. There were no publicly available MT5 point-and-figure indicators at the time this article’s publication. Now (as of 16 May 2013) such indicators are already present and can be freely downloaded. 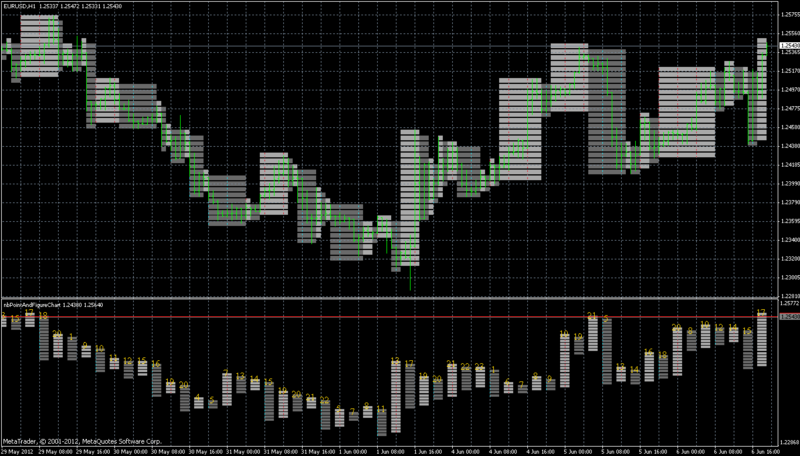 APFD — a detailedly explained point-and-figure indicator coded in MQL5 and based on M1 charts plotting. It was developed by Dmitriy Zabudskiy. APFD displays in a separate indicator window and, rather untraditionally, is using the candle indicator plot rather than graphical chart objects. This allows for a faster drawing but does not look as good as the old school X’s and O’s. Additionally, the indicator is glitchy. Fortunately, it can be cleared and redrawn with hotkeys. XO v01 — a P&F indicator programmed by Alexey Sergeev and Boris Gershanov from FINEXWARE Technologies GmbH. Same as APFD, it displays the chart plot using candlesticks rather than chart objects, but for some reason it also adds candlewicks to them. Also, it does not show any reference levels in its separate window, and it is really hard to tell how many rising or falling cells are inside one bar. 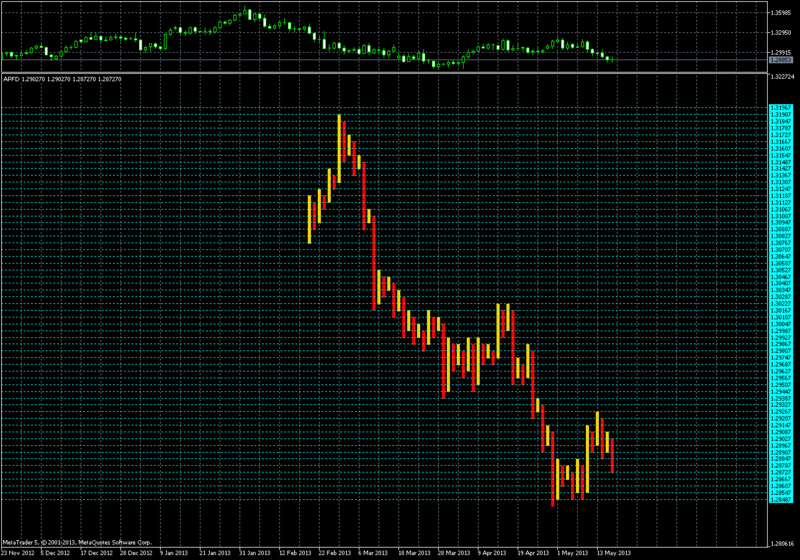 This indicator is plotted based on the chart’s timeframe it is attached to. Although it was published much earlier than APFD, I consider it somewhat inferior to the latter and list it second. There are also some paid P&F solutions. I have not tested any of them. Obviously, they should be better than the free options, at least in some minor details, but I will leave that for you to discover. By the way, if you have already tried any of point-and-figure solutions below, please share your experience. MultiCharts — prices start from $99 per month but a free trial version is available. It is a professional charting software package and it is heavy-loaded with features. P&F is just one of the many tools it has. 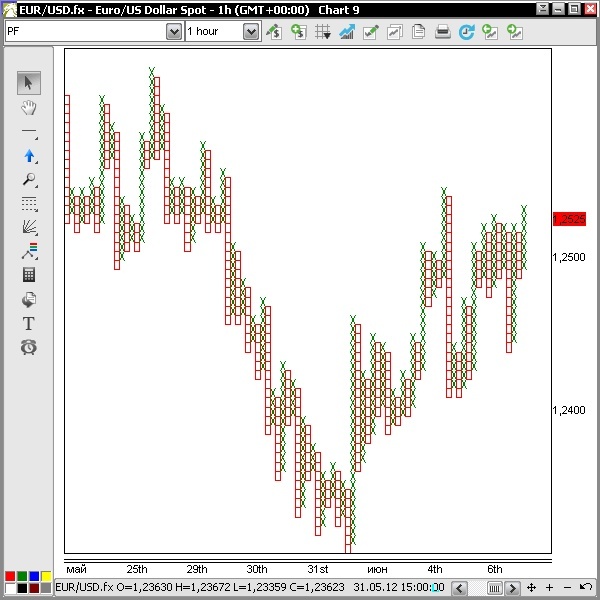 TraderPro by Updata — from £49 per month, this software will be able to draw point-and-figure charts for you. Bull’s-Eye Broker — a specialized P&F software package that can be purchased for a one-time fee of less than $70. Among the features are: automatic P&F pattern recognition, works with many data sources, automatic calculation of price objectives and P&F indicators. Cute Point & Figure Indicator v.1.3 — a more advanced but paid ($29) version of the above-mentioned free indicator for MetaTrader 4. Supports moving averages, alerts; displays price reverse time; offers optimized performance and more templates. Point and Figure Charts XO Indicator by Itic Software — a rather plain P&F indicator offered for $78. Point & Figure for Forex — an article from one of the issues of Technical Analysis of Stocks & Commodities magazine back from 2007. It offers a basic explanation of the XO charting and provides descriptions of 6 patterns. Point and Figure Charting: a Computational Methodology and Trading Rule Performance in the S&P 500 Futures Market — a scientific research paper by John A. Anderson and Robert W. Faff. It provides a clear scientific definition of point-and-figure charts and uses simulation through ultra-high frequency data (S&P 500 futures) to test 8 different patterns’ performance. The results are both interesting and promising. Point and Figure Charting by Thomas J. Dorsey — a rather expensive book by the P&F guru who also runs PnF University, which offers some free lessons on the subject. The Definitive Guide to Point and Figure by Jeremy Du Plessis — the book is costly beyond common sense, but is praised by many as a bible of point-and-figure charting and trading. 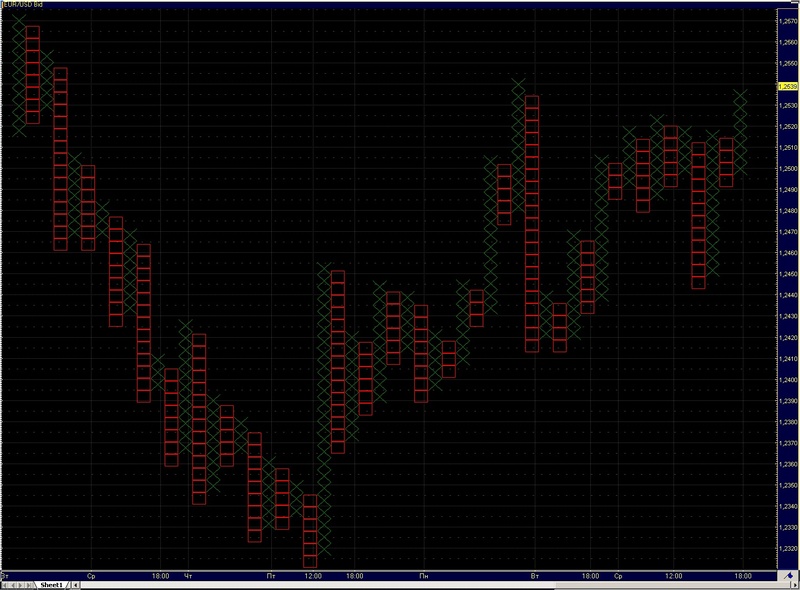 I have probably overlooked many interesting and powerful P&F charting indicators, software or educational resources. If you know some good examples, please do not hesitate to let us know. 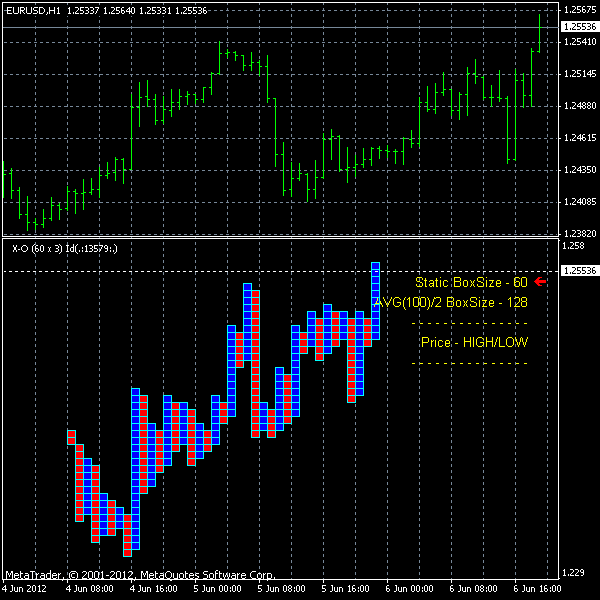 Update 2013-05-16 22:09 GMT: Added two MT5 point-and-figure indicators, separating MetaTrader section in two — MT4 and MT5. If you have anything to add or ask about the use of point-and-figure charting in FX trading, please use the commentary form below. Dukascopy also have a PnF chart but is only 1×3, the nbPointandfigure is the best indicator i ever found, you can see the x´s and o´s on your main chart if you(like me) are to tied to timeframes, does anybody knows who is the developer of this awesome indi? No, unfortunately I do not know its author. Found it on one of the Forex forums. Congrats on the fantastic site!